The Whopper Plopper takes topwater fishing to the next level. While his big brothers rely on powerful chops of their tail to attract strikes, the Whopper Plopper 75 by River2Sea relies more on quickness. With a unique sound more reminiscent of a buzz saw, the Whopper Plopper 75 is tailor made for topwater fishing in high pressure situations and when the forage base is smaller. 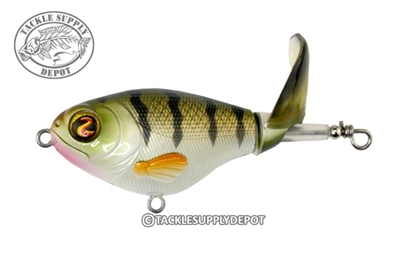 The Whopper Plopper has accounted for countless fish catches and tournament wins. Whether fishing for big game such as Musky and Stripers to Largemouth and Smallmouth bass the Whopper Plopper has made its name known and now the family has grown again with the Whopper Plopper 75. I received the product in just a few days. I have not had a chance to use the model 75. Wish they had made additional colors such as the PACMAN and YODA in model 75. The ordering process on line was quick and easy. Received a confirmation it had shipped. Package arrived in great shape. Will order again. I purchased one of these just to give it a try and its ok but Im not sure that Id buy any more. It seems to have the same problem as the 90 size where it can be really hard to actually get it to plop. I did catch one fish on it the first night. So I cant say it doesnt work but personally I think the 110 is still the way to go. Just seems to work much better as far as a very consistant plop while retrieving it. Love the new bait. Bigger than I thought but deadly at triggering strikes!